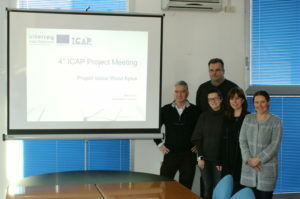 The fourth ICAP project meeting took place on Wednesday, February 14th in Amaro, at the Innova FVG Innovation and Technology Center. The fourth ICAP project meeting took place on Wednesday, February 14th at Amaro, at the Innova FVG Innovation and Technology Center. Partners go through the WPs to make the point of the situation and plan activities. Concerning WP1 Project management Da Cortà informs that the request to extend the project has been forwarded. Concerning WP2 Communication, the WEBsite has been further improved and appreciated by customers. Partner discuss about promotional materials to buy. Partner discuss about next workshops: W3C will organize an event in April and INNOVAFVG intend to organize 3 workshops in May concerning treatments respectively on metals, plastics and wood. Partners summarized the progress of the project, both as regards the results of some tests carried out to improve the performance of coatings using atmospheric plasma, and the results that emerged from the tests with the PECVD TETRA implant. Company visits also continue to better understand the needs and to bring out their needs. The possibility to improve the physico-chemical performances of plastic materials and / or wood fibers was also put at the table. As for the dissemination process, the partners illustrate suitable interactions with conferences and events organized not only in the Program Area but also in the neighboring territories. The next ICAP meeting will be held in Certottica.